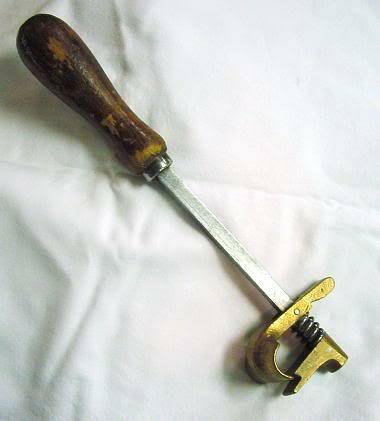 Model T Ford Forum: How do you use this tool? Model T Ford Forum: Forum 2014: How do you use this tool? 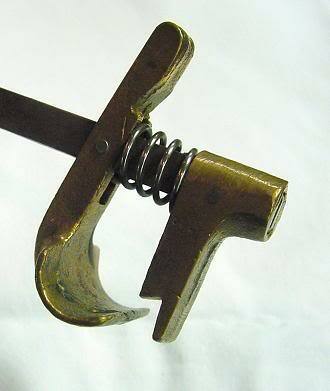 This tool is a "Calcutt's Tire Lifter." Pat'd Dec31 1907. How would you use this. They say it is for early autos and bicycles. Thanks Ed. I don't see how it would ever fit over a T tire maybe a quadracycle or bicycle. I did some Googling. It appears there was a gentlemen named R.B. Calcutt who was a long term employee of the United States Rubber Company and was involved in the development or manufacture of a wire encased hard rubber tires. I believe the tool is for mounting hard rubber tires on baby carriages, tricycles, etc. There was something called Calcutt's Quick Repair Tire for go carts (aka baby carriages), a hard rubber tire that had a coiled wire inside. Well that might be but Ed's picture and patent search says it is used for pneumatic tires on autos and bicycles. The man that sold it to me said he did some research and it was for T's (although it couldn't be with a patent date of 1907) and bicycles. It would surprise me that he found what Ed found. Anyhow I didn't pay much for it but I would like to know if I can use it on my T for discussions sake. With the handle and paper tag as a size reference, I presume your particular tool is the size of a large screwdriver which, in my opinion, makes the business end too small for automobile tires. Pneumatic bicycle tires during that time were tubeless and cemented to a wooden rim so it's possible your tool was used for installing bicycle tires. However, based on experience with turn of the century safety bicycles the radius on the business end also seems too small for the typical tubeless tire. 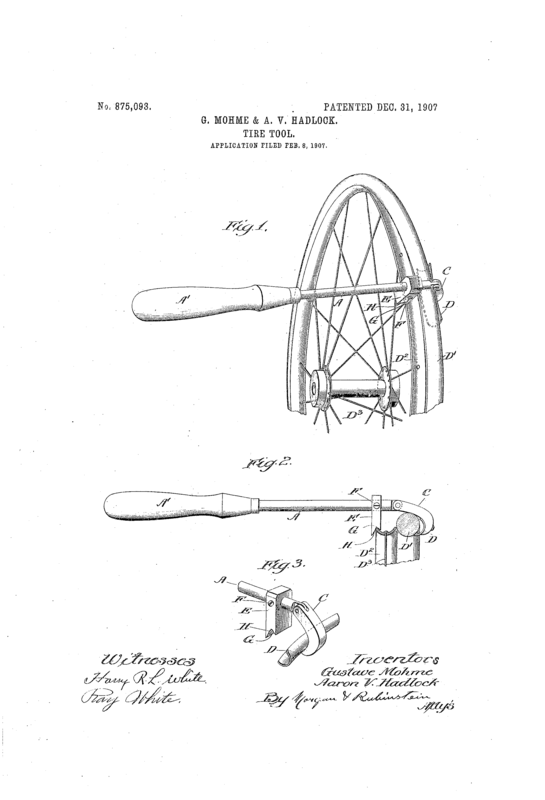 An excerpt from patent # 914481 covering �Tires for Vehicles� issued to R.B. Calcutt. is a full, clear, and exact description. such as baby carriages, velocipedes, etc." while patents # 1100712 and 1104774 appear to be for the same thing. Thanks guys. I am also convinced that it must be like you say for hard rubber tires such as baby carriages. I guess I got mislead on the buy but hey I didn't pay too much and I can tell guys it is for changing the blinker fluid or something.